One of the main reasons that KANcycling is based in Kansai is proximity to everything in this area (no, it’s not just so we can make the pun!). Tokyo is great, but it’s so huge that it’s both expensive and time-consuming to get anywhere else. Just by virtue of being in Kansai, on the other hand, you have quick and easy access to places as different as Osaka, Kyoto, Kobe, Nara, Himeji, Lake Biwa, Shikoku, the Inland Sea, the Japan Sea, and so on. And if you have a special interest in Japanese culture, then you’ll appreciate the ability to go to Kyoto and Nara any time you like. There are multiple events going on every day in both cities that date back hundreds or even thousands of years, and you could spend multiple lifetimes without exhausting the riches in either of those cities. 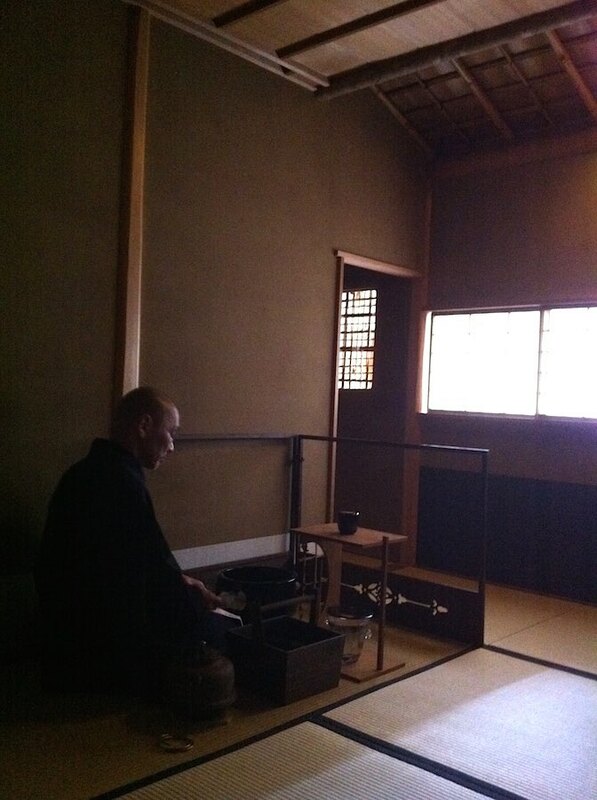 In the last decade or two, many private organizations have sprung up with the goal of preventing the decline of traditional culture in Kyoto and other cities. 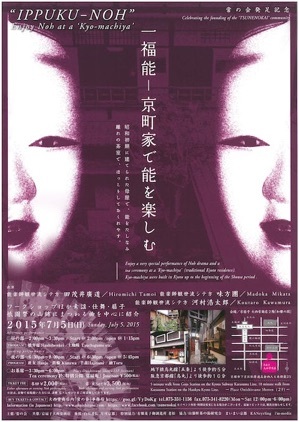 One of these, formed last year, is the Tsunenokai, devoted to preserving the culture of traditional machiya in Kyoto. We went to their first event; here is our long-delayed special report. 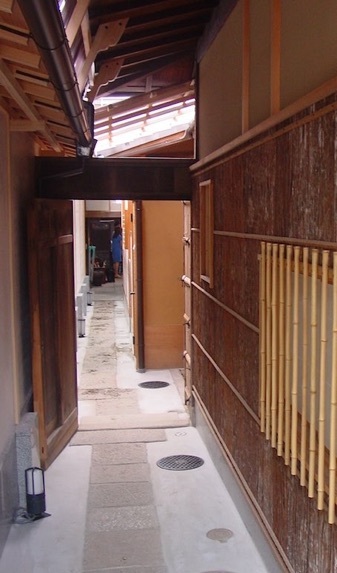 Two of the most common traditional residences in Japan are noka (farmhouses) and machiya (wooden townhouses). 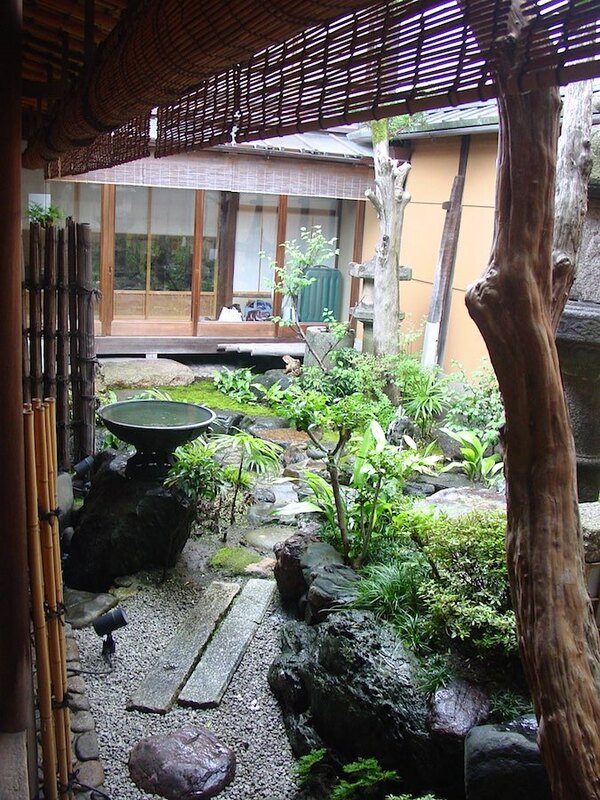 The latter were built throughout Japan, but they are so closely identified with Kyoto in particular that they are often referred to as “Kyo-machiya.” Their origin is apparently the result of tax policy. 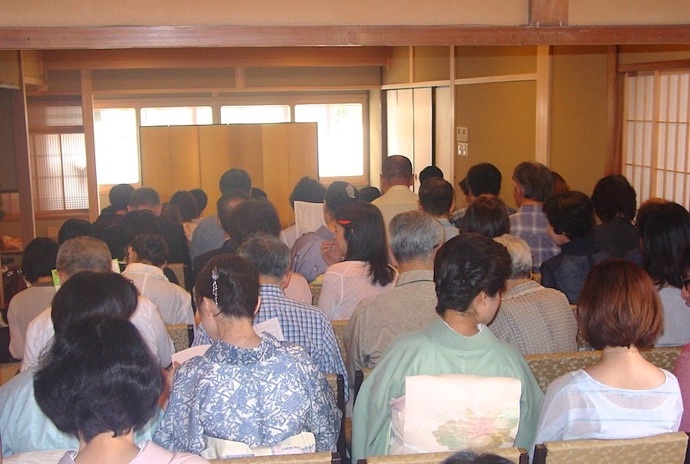 Property taxes in Kyoto were assessed based on the length of frontal road that the building occupied. This, naturally, encouraged people to build long, thin houses and shops that occupied only a tiny area of the road but stretched very far back into the lot. Usually the front of the residence also served as a storefront, and there was also usually at least one inner courtyard, near where the family lived in the back. Up until a few decades ago there were tens of thousands of machiya in Kyoto, but as they are relatively expensive to maintain, they have been disappearing in recent years. 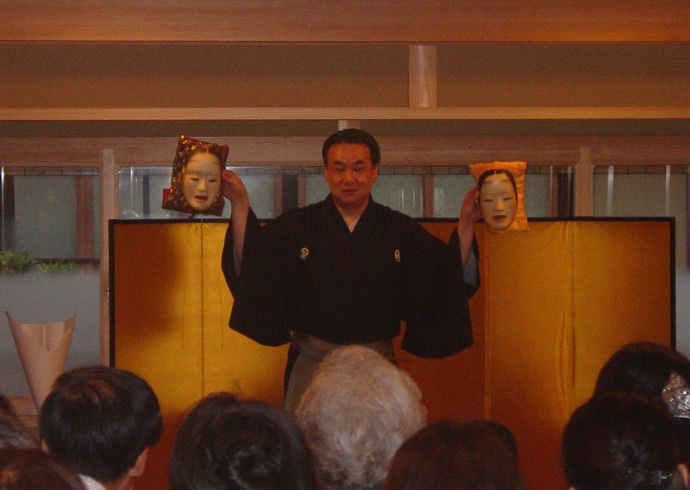 The rather unusual concept for this event was to present “a taste of” Noh theatre in a machiya. 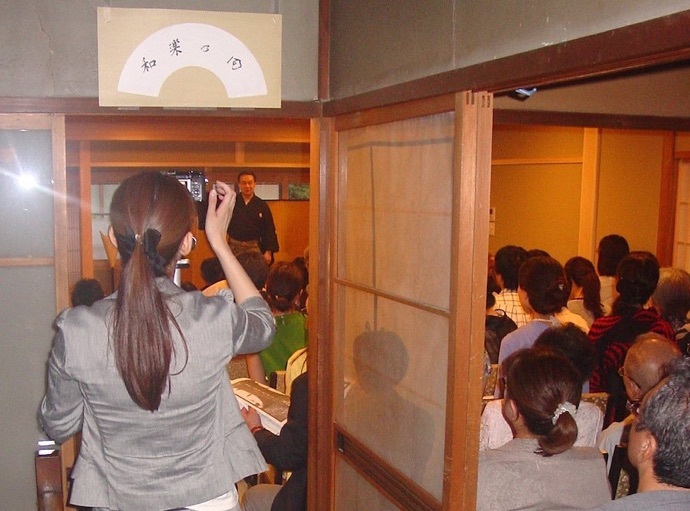 The venue was Onishitsune, a family business that crafts Japanese folding fans and has existed for nearly a century. Here and there you can see accommodations made to the modern age. 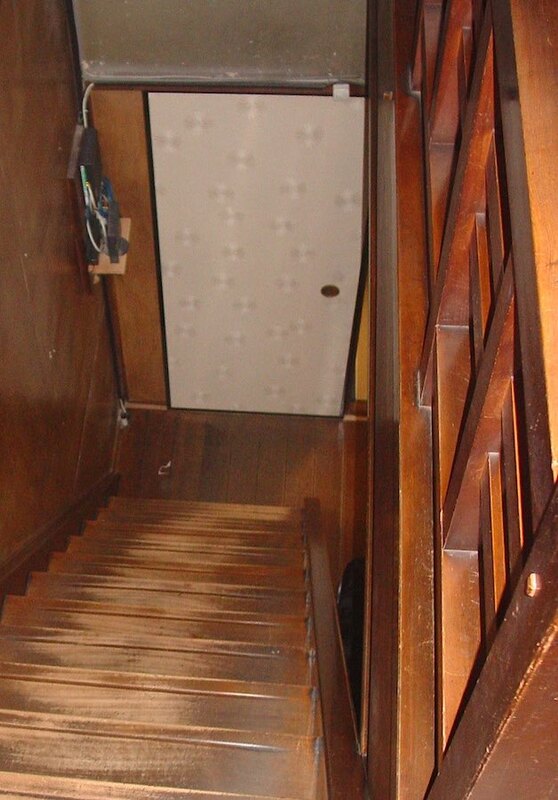 At the bottom of the stairs is the Internet router, placed unobtrusively on a tiny shelf in the stairwell. 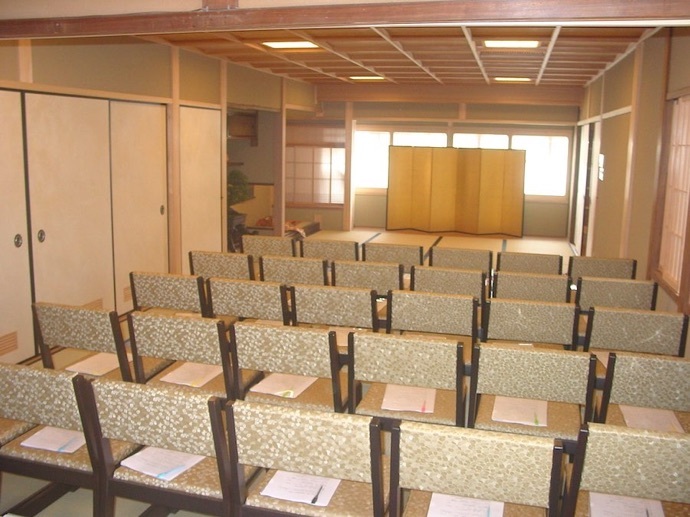 The machiya has recently been renovated and reinforced to make it possible to hold events for 50-60 people on the second floor. 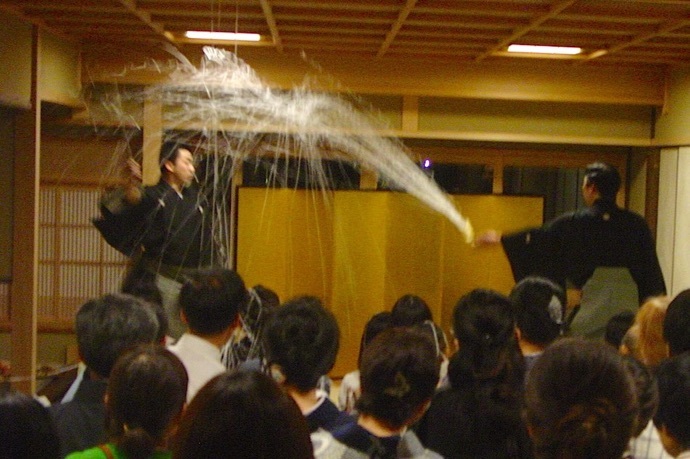 There are many private organizations in Japan that are working to preserve traditional Japanese culture, and this event did not escape notice; much of one of the performances was videoed by one such organization. 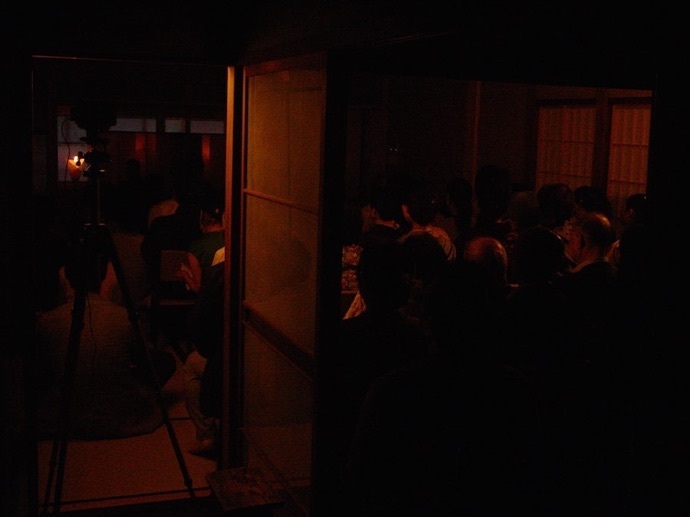 There were two performances, afternoon and evening. 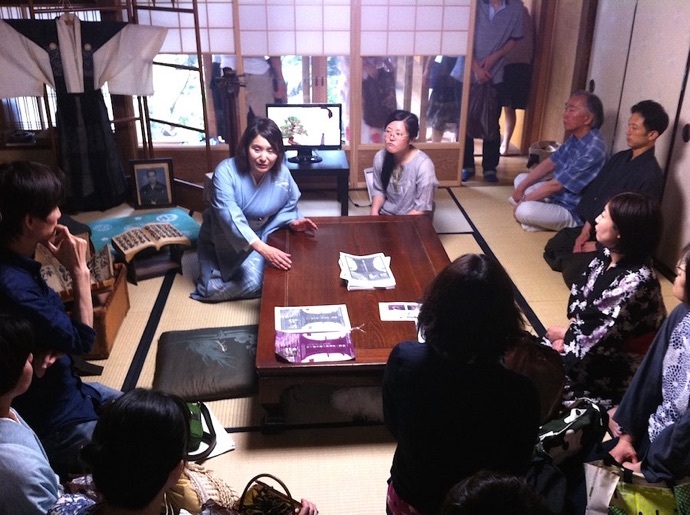 In the break between performances, the proprietress of Onishisune (in blue) talked about the history of the shop and the special challenges of living in and maintaining a machiya. 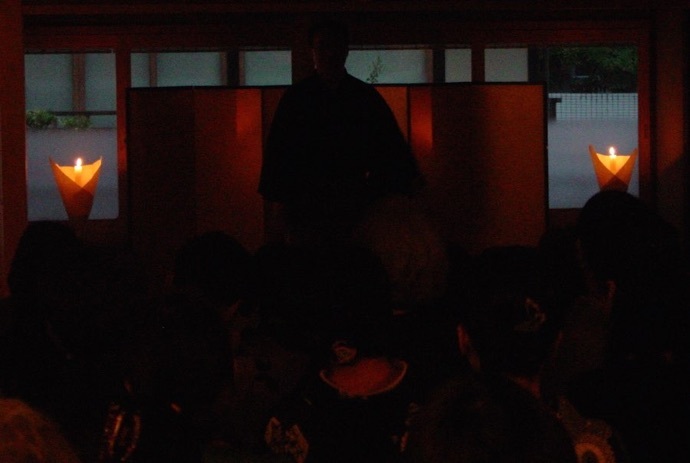 The evening performance featured something unique: an indoor version of the famous Takigi-Noh, or Noh by firelight, performances of which are often held in the autumn. Obviously this doesn’t lend itself well to photographs; you really had to be there. 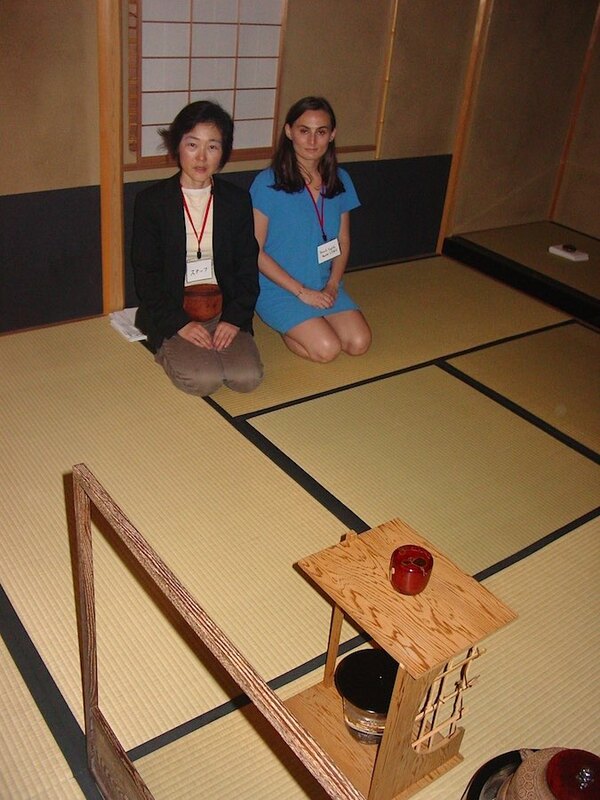 The intimate venue resulted in spontaneous connections that would not have been possible in a more formal setting. 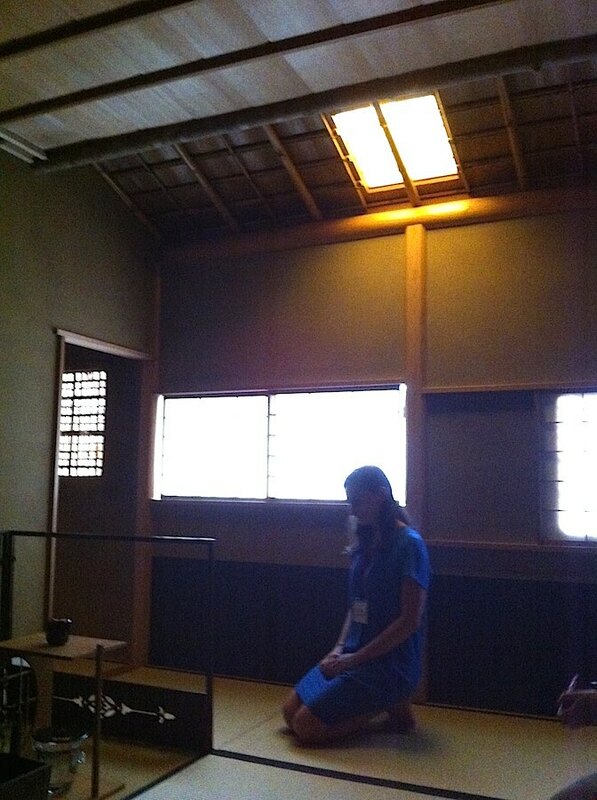 For example, after the performance, the Noh performers stayed around on the second floor for an informal chat with the audience that was as informative and worthwhile as the performance itself had been. All in all, a fine debut for a worthy cause. Japan is a truly lovely country to cycle in, but KANcycling encourages you to get “off the bike” now and then and explore its riches in other areas as well — particularly in the Kansai.